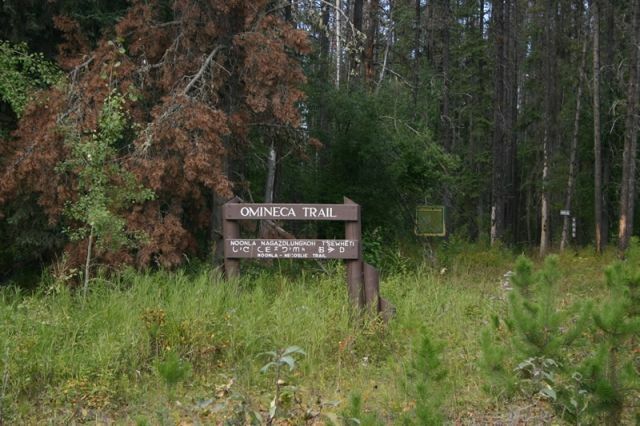 Omineca Hiking Trail in Vanderhoof, British Columbia, Canada is a long haul, one-way 15 kilometre backpacking, horseback riding, xc skiing and mountain biking wilderness route following the same historical footsteps as the Carrier First Nation People. Today the trail is identified by yellow diamond tree markers. The ancient trading and transportation route once connected Stoney Creek to the First Nation Village of Nati, Stuart River, Stuart Lake and a Hudson Bay post. The First Nation people used the trail to gather food and supplies, hunt and to war with other villages. The footsteps of many great First Nation leaders walked the Omineca Hiking Trail like Chief Kwah and Chief Louis Billy Prince. In the late 1800's the trail was discovered by European explorers. It did not take long for the early European prospectors and muledrivers to arrive when word got out about a gold strike in the Omineca Mountains north of the Hudson Bay post in Fort St. James. The trail soon became the transportation route connecting the Ezra Evan's Ferry on the Stuart River to the gold rush towns of Manson Creek and Germansen located further north closer to the gold strike. European explorers like Sir William Francis Butler, Rufus Sylvester and Cataline hiked this exact trail. Th trailhead is north of Vanderhoof, BC located on the same grounds as one of the early pioneer homesteads in the region. In the early 1900's the Hunt Family built a 9 acre farm with a 7 acre oat field. Lack of water and poor soil forced the Hunts to move on. From the trailhead the route explores vast meadows, lakes and rivers connecting to an old ferry crossing on Stuart River. The moderate, sometimes tough, trail can get rugged and muddy. Along the trail are many offshoot trails leading to various other popular wilderness destinations like Wonder and Expected Lakes. Located in the parking lot of the Vanderhoof trailhead are some information signs. 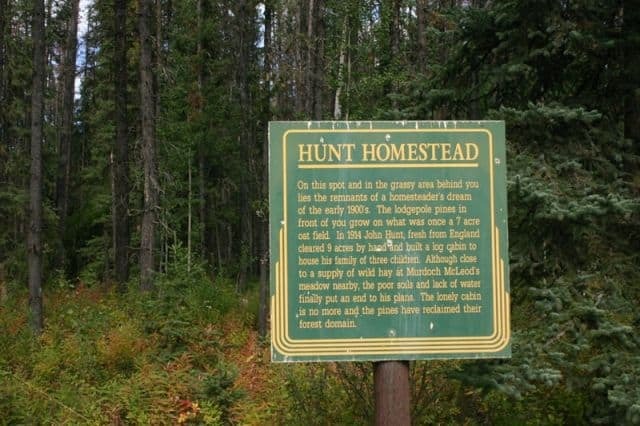 There is one sign outlining the History of the Hunt Family and another sign about the history of the Omineca Trail. 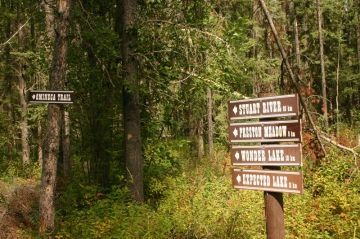 At the trailhead is a distance sign pointing to each destination - Stuart River is 16 Kms, Preston Meadow is 9 Kms, Wonder Lake is 10 Kms and Expected Lake is 11 Kms. The trail is a one way trail, so to return you would have to double back. Please make all the necessary overnight preparations for wilderness camping conditions if hiking on foot. There is a pit toilet at the trailhead and a small grassy parking lot. How to Get Here: Drive 1.5 Kms north on Burrard Avenue (main street Vanderhoof) to Northside Road. Turn right and continue for 5.4 kilometres to Striegler Rd located on your right just pass the airport. The entrance of the road is identified by a large "Elephant Brand" business billboard. Travel down the dirt road until you see the yellow 4 kilometre marker. The parking lot is on your left.